Later this year, Disneyland will host what could be its biggest opening since 1955, as Star Wars: Galaxy's Edge welcomes the first guests to the fictional planet of Batuu. There's no telling how many fans will flock to this "remote outpost on the galaxy’s edge," but the Disneyland Resort has spent the past two years preparing for its arrival. The preparations—code-named Project Stardust—are not limited to the very visible construction site behind Frontierland. As Walt's original park expands its footprint to include a galaxy far, far away, park managers are looking at every aspect of the customer experience. Some of these projects are already complete around Disneyland, with more currently underway. Earlier this week Disney hosted a small tour of Disneyland park to provide a look at projects already completed, and discuss those still to finish before Batuu welcomes the first visitors. A print of this Herb Ryman art will cover the front of Sleeping Beauty Castle during refurbishment this spring. Photo © Disney. The most visible project currently underway is the refurbishment of Sleeping Beauty Castle. The $300,000 makeover includes replacing the building's roof. Imagineer Kim Irvine, working on the sixth castle refurbishment of her storied Disney career, notes that each project has brought changes to the Disneyland icon. From adding squirrel downspouts and stained glass windows, to brightening the colors and adding gold-plated spires, each effort has given the castle extra polish. However, Irvine assures fans there is no major change planned for the castle's current color scheme as part of this renovation. Still, nobody dreams of taking their Disneyland vacation photos in front of a castle that's surrounded by scaffolding and construction walls. 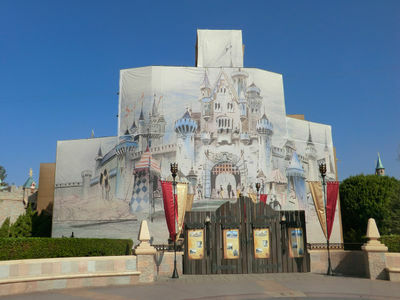 During the 2004 refurbishment, Disney tried to decorate the tarp-covered castle with oversized cutouts of the playing cards from Alice in Wonderland. 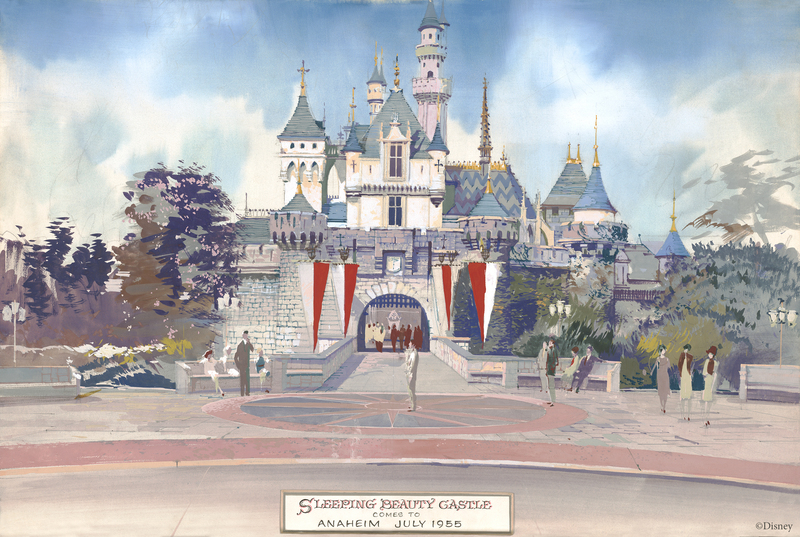 In 2015—thanks to advances in large-format print technology—Disney wrapped the structure with a full-color version of Imagineer Herb Ryman's concept sketch for Sleeping Beauty Castle. For this project, Disney will again wrap the front of the castle with another piece of Herb Ryman art, giving visitors—if not the actual castle itself—a compelling backdrop for their snapshots. Some fans might prefer the photo opportunity offered by the scrim Disney will hang on the back side of the castle. The Fantasyland side of the scaffolding will feature an oversized image of Prince Phillip battling Maleficent in her dragon form. Look for both of these pieces to be installed by early February. Disney says the castle refurbishment will last through spring 2019. A print of Herb Ryman's original concept drawing for Sleeping Beauty Castle covers construction scaffolding during a 2015 refurbishment. MousePlanet file photo. Many expect the opening of Star Wars: Galaxy's Edge is to bring record crowds to Anaheim, with Disneyland reaching capacity on a daily basis for the first several weeks or even months of the new land's operation. Anyone who has ever visited Disneyland during the Christmas season knows just how difficult it can be to navigate the fully packed park, and many of Disney's efforts are focused on improving traffic flow around the park during peak periods. 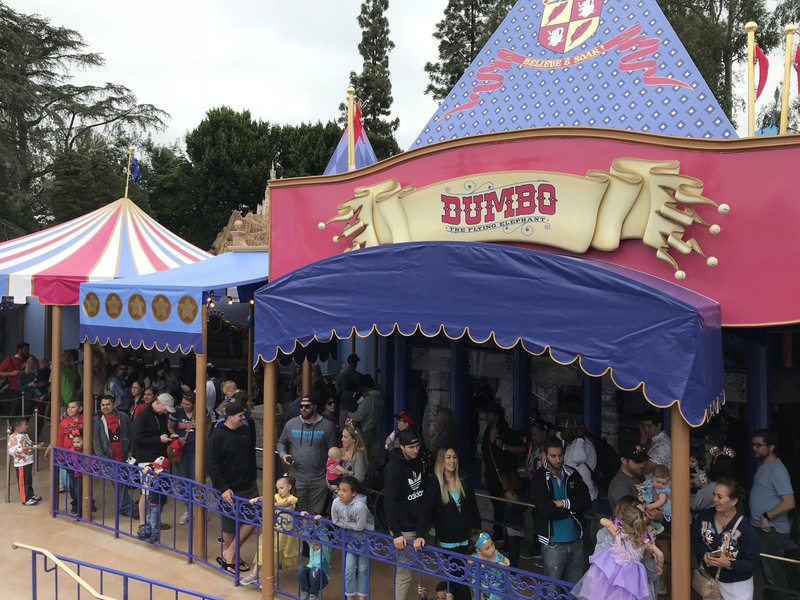 In 2018, Disneyland redesigned the queues for several Fantasyland attractions. A new queue at Dumbo the Flying Elephant provides shade to what had previously been an unprotected waiting area. A new entrance for riders who use the Disability Access Service (DAS) reduces congestion around the ride. At the Matterhorn Bobsleds, a new entrance area greets both riders using Disney's Fastpass system and those joining the standby line, while a redesigned walkway around the attraction helps prevent bottlenecks. A larger, shaded queue for Dumbo the Flying Elephant opened in 2018. MousePlanet file photo. The line for "it's a small world" received a major update this year, as Disney altered the parade route to create an extended queue adjacent to the attraction. Before this change, the line for "it's a small world" could extend across the parade route, creating problems for both crowd control and the entertainment department. The new queue is large enough for peak traffic days, and is also wheelchair accessible. Adventureland is another focus area for the Project Stardust team, which will soon rework the entrance to Adventureland to widen the walkway. The plans for the updated entrance are based on original Disneyland concept art. Disney has already taken steps to improve traffic flow through the cramped land by removing some bench planters and creating a designated stroller parking area off the main thoroughfare. Executives condensed three Adventureland stores down to two, and converted the third into an indoor seating area for the popular Bengal BBQ. 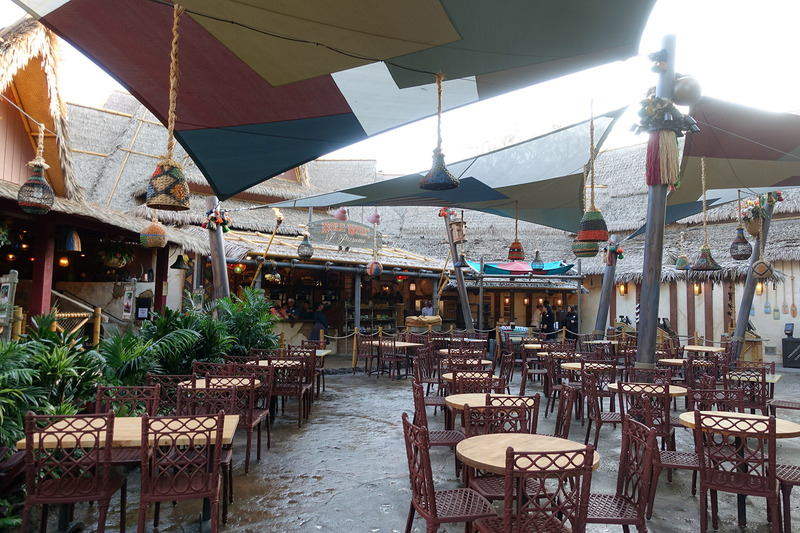 The most recent addition to Adventureland was the debut of the Tropical Hideaway, a new quick-service restaurant in the former Aladdin's Oasis space. The new offering helps address several needs in the area. It converted a largely unused space into a new restaurant and seating area, which helps pull congestion from the walkway outside the Jungle Cruise. It also provides a second location for customers to purchase the popular Dole Whip treat, which in turn makes for shorter lines at the Tiki Juice Bar. The Tropical Hideaway converted an shuttered theater into a new restaurant and seating area. MousePlanet file photo. In talking about preparing Disneyland for future expansion including and beyond Star Wars: Galaxy's Edge, Disney executives note that their customers have changed quite a bit since 1955, and have much different needs and expectations than their earliest visitors. Strollers, both single, double and wagon-sized, are now prevalent inside the theme parks. Disneyland's petite Fantasyland was not designed with large stroller corrals, and haphazardly parked strollers slow traffic through already tight walkways. Park mangers are working to create new solutions for stroller parking throughout the park, and looking for ways to help encourage visitors to use existing parking areas. Likewise, Disneyland predates both electric convenience vehicles (ECVs) and the American's with Disabilities Act (ADA). The park is currently working to add ramps along Main Street U.S.A. to make it easier for people using wheelchairs to navigate the walkways, and has redesigned several attraction queues to provide better access, including Dumbo, "it's a small world," and the Matterhorn. Technology has also changed the way Disneyland fans experience the parks. Introduced in 1999, Fastpass revolutionized the way in-the-know visitors waited for their favorite rides, but it also meant separate queues and entrances to accommodate Fastpass and standby riders. MaxPass changed the game again in 2017, offering more benefits to those willing to pay for them. Another game changer is Disney's mobile ordering service, now expanded to 22 venues, including one hotel restaurant. These types of virtual lines keep visitors out of actual lines, which can help reduce congestion around rides and restaurants. Disney can also use these tools to help manage traffic flow around an area. In one example, Disney knows that people frequently head for the nearest attraction after a parade ends, resulting in a crush of people at the rides closest to the parade route. For this reason, Disney issues fewer Fastpass tickets valid around the time a parade ends, to keep from sending any more people into an already crowded area. Park managers can adjust the distribution rates for Fastpass tickets on a daily basis as needed, to help fine-tune traffic patterns. With all of the changes already made and still to come, Disney seems focused on making as many operational and physical improvements as possible to accommodate the crowds this summer. Of course, all the Pixie Dust in the Galaxy won't change the fact that Star Wars: Galaxy's Edge is roughly the size of Cars Land, and will definitely generate more demand than it can handle for the first months. This is going to be one interesting summer.